Note the ‘McCalls’ written in the top left hand corner. 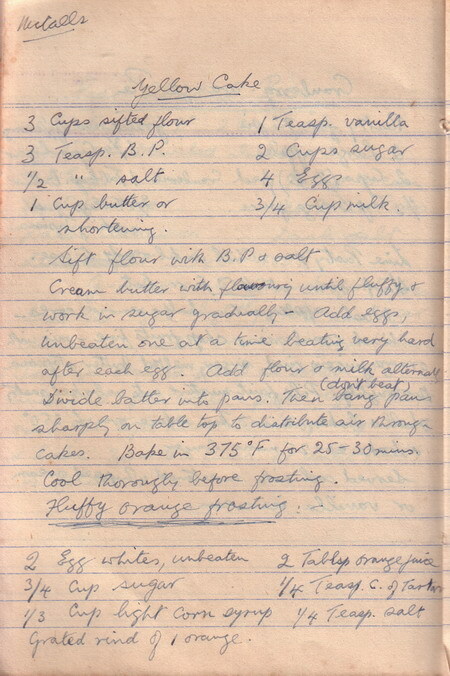 This is one of several recipes in grandmother’s notebook which came from McCalls, the popular American women’s magazine. Find the full list of other McCalls recipes here. [Corn syrup] is used extensively in the manufacture of processed foods and beverages in the US, because it does not crystallize as readily as sugar and is generally less expensive (although it is also not as sweet as sugar). It is available to consumers in the US in two forms — light, which has been clarified to remove all color (and which is essentially flavorless), and dark, to which caramel color and molasses have been added. Because of its tendency not to crystallize, it is often called for in recipes for frostings, candies, jam, and jellies. If light corn syrup is not available, you can substitute a sugar syrup made with 1-1/4 cups sugar and 1/3 cup water, boiled together until syrupy. Other recipes for light corn syrup substitutes can be found here and here. In recent years, high fructose corn syrup has come under intense scrutiny from critics of the processed foods industry, as you can read here and here. “B.P.”, if you haven’t already figured out, refers to baking powder. I’m a French literary translation and I would like to know if there is a specific French equivalent to “yellow cake”. Je suis désolée, je ne sais pas le nom en Français. What a treasure to have recipes handed down through generations! I found this site too late to make the cake, but I did the frosting, albeit not exactly as written: I was feeling a little lazy and didn’t want to dig out seldom-used double boiler. I figured the heat was needed mostly to dissolve the sugar, so I used a heavy saucepan and wire whisk until mixture was frothy, then beat w / electric mixer. It took about FOREVER, but that’s ok — great “zone-out” time! Frosting is great atop my homemade orange cake. Just right.